MSRP: $452.00 Click For Rebate Coupon! 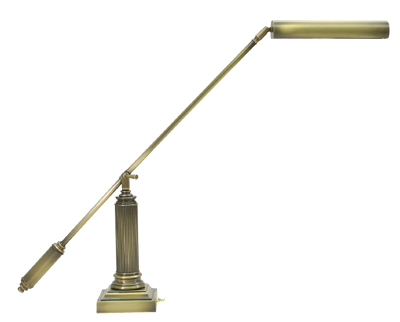 PG Fluted Antique Brass Column Counterweight Lamp - Free Ground Shipping is rated 4.23 out of 5 based on 108 ratings. MSRP $452 - for a special Discount click rebate! Antique brass and elegant design make this a timeless gift for piano players. Antique brass column, arms and shade. The base is 5" across and on top stands a column approximately 12" high. There's an 8' cord, A very stable 12 lbs.